Summary of Robbins chapter 7 (neoplasia) Summary of chapter 7 from Robbins pathology belonging to the content of theme 3 of year 1 medicine in 2014/15. 1. Mixed top diseases Notes used for my final exams of pathology in Medical school; written from various sources including Pathoma, Robins pathology, and lecture notes. Note: this file may only consist a number of few topics covered during the first pathology exam in my university; it does not include all top diseases. 11. Skin, Muscle, and Bones diseases Notes used for my final exams of pathology in Medical school; written from various sources including Pathoma, Robins pathology, and lecture notes. 7. Gastrointestinal diseases Notes used for my final exams of pathology in Medical school; written from various sources including Pathoma, Robins pathology, and lecture notes. 2. Hypertrophy-Hyperplasia Notes used for my final exams of pathology in Medical school; written from various sources including Pathoma, Robins pathology, and lecture notes. 4. Neoplasia Notes used for my final exams of pathology in Medical school; written from various sources including Pathoma, Robins pathology, and lecture notes. 5. Pulmonary diseases Notes used for my final exams of pathology in Medical school; written from various sources including Pathoma, Robins pathology, and lecture notes. 6. Cardiovascular diseases Notes used for my final exams of pathology in Medical school; written from various sources including Pathoma, Robins pathology, and lecture notes. 3. Metabolic-Cardiac-Pulmonary Notes used for my final exams of pathology in Medical school; written from various sources including Pathoma, Robins pathology, and lecture notes. 8. Billiary Diseases Notes used for my final exams of pathology in Medical school; written from various sources including Pathoma, Robins pathology, and lecture notes. 10. Female Reproductive system disease Notes used for my final exams of pathology in Medical school; written from various sources including Pathoma, Robins pathology, and lecture notes. 9. Male Reproductive system diseases Notes used for my final exams of pathology in Medical school; written from various sources including Pathoma, Robins pathology, and lecture notes. NEOPLASIA This is a presentation for Neoplasia. It is presented in a unique manner in order to serve as a study source. It allows you to skip all the details provided from the book. It also contains pictures with every topic and disease presented. Cellular Reaction to Injury Cellular reaction to Injury, is one of the prerequisites to pathology. Gastrointestinal Pathology A well presented and easy presentation on GI pathology. Each concept is provided with histological pictures for clarification. Overall, this presentation serves as your study source and makes reading the book optional. Cardiovascular Pathology This is a presentation for cardiovascular pathology. It is presented in a unique manner in order to serve as a study source. It allows you to skip all the details provided from the book. It also contains pictures with every topic and disease presented. 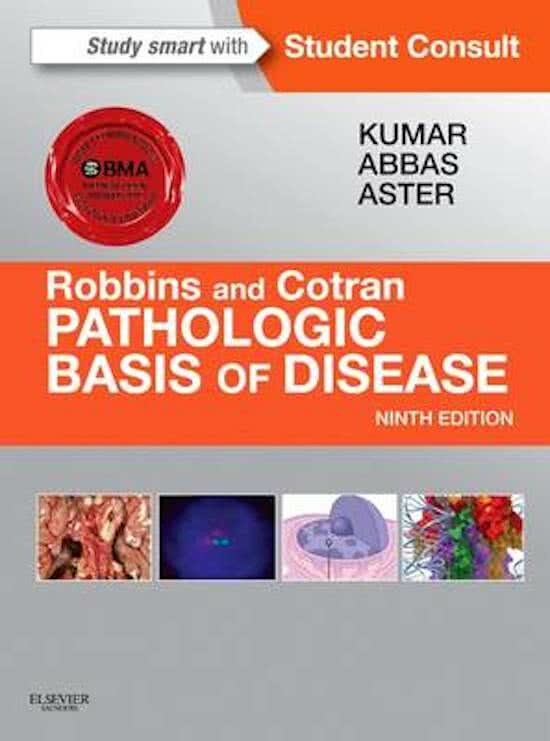 Auf dieser Seite findest du Zusammenfassungen, Mitschriebe, Arbeitshilfen und vieles mehr für das Lehrbuch Robbins & Cotran Pathologic Basis of Disease. Die Zusammenfassungen wurden von Studenten persönlich geschrieben, was dir wiederum einen Einblick darin ermöglicht, was beim Studium dieses Buches besonders wichtig ist. Themen wie Neoplasia, Patho, Gastrointestinal, Muscles, Skin, Cardiovascular, Robbins & Pulmonary werden behandelt.